The regal Weimaraner was bred as a hunting companion for gentlemen who wanted a companionable sporting dog. The energetic breed is always happy to take to the trail or the field, and any chance to run is gladly accepted. This majestic breed has a striking silver-grey coat and remarkable eye color. As a large, spirited dog, the Weimaraner is happiest when both body and mind have enough stimulation. People with an active lifestyle are the best match for the lively Weim. This prized breed was difficult to find outside of Germany until the 1920s, but is now one of the most popular breeds in America due to its loving nature. Coat - Weimaraners display a regal grey to silver-colored short, smooth, single coat. A Weimaraner with a black or blue coat may also be registered, but these colors will disqualify him from the show ring. Weim puppies are born with tiger stripes that fade completely a few days after birth. After an injury, the fur may grow back white instead of grey. Though the American Kennel Club (AKC) does not recognize long-haired Weimaraners, these pups may be born to parents who each carry the recessive long-haired gene. Originally used as a gundog and companion for nobility, the Weimaraner was bred to strict standards. It was named for the Grand Duke of Weimar who is credited for creating the breed. The Weimaraner dates to the 19th century and was first called the Weimar Pointer, though records and art suggest similar dogs may have been present in the court of Louis IX of France in the 13th century. A mix of Bloodhound and German Shorthair Pointer may have been the source of the current breed. In an attempt to maintain strict breed standards, Germany restricted ownership to accepted members of the German Weimaraner Club, and no dogs could be bred without their consent. Any dogs not suitable for breeding were sterilized, and it was rare for any Weimaraner to be exported from region. Howard Knight, an American, was accepted into the German Weimaraner Club and allowed to import Weimaraners to America for breeding. The popularity of this hard-to-get Weimaraner grew and the Weimaraner Club of America was formed in 1942. The AKC recognized the Weimaraner in 1943. President Dwight D. Eisenhower owned a Weimaraner named Heidi, leading to the breed's gain in popularity. Grace Kelly also owned Weimaraners. Artist William Wegman's Weimaraners are well known from his celebrated portraits and videos. The Weimaraner is a friendly, loyal companion with an alert and obedient disposition. His intelligence, paired with a bold, headstrong nature, results in an assertive dog who benefits from early, ongoing training and plenty of activity to prevent boredom and destructive behaviors. Hunting characteristics and prey drive are still present in this sporting breed. Are Weimaraners Good with Kids? The Weimaraner is a friendly, outgoing dog who often does well with children. But because he is large and high-energy, he may inadvertently knock over small children. Are Weimaraners Good with Other Pets? 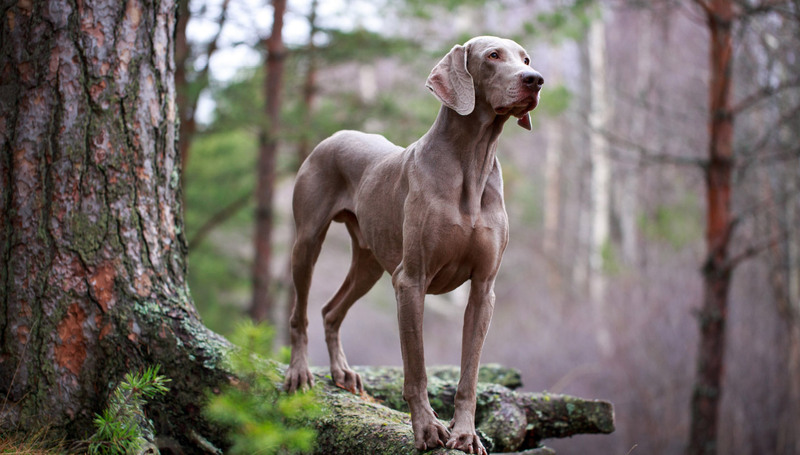 The hunting instinct and prey drive are strong in Weimaraners, and they are likely to chase or injure small animals such as cats, rodents, and small dogs. They may do well with other dogs if socialized from an early age, but without proper socialization they can display dominant or even aggressive behaviors. The Weimaraner has been used to guard homes throughout history. They are watchful and alert and will bark at the approach of a stranger, so the Weim may make an admirable watchdog—without viciousness or aggressive behaviors. The extremely high energy level of the Weimaraner breed makes for an athletic dog who needs a considerable amount of exercise to prevent rambunctious, destructive behaviors. Indoor Weimaraners are high-energy, excitable dogs who are better behaved indoors if they receive plenty of outdoor activity throughout the day. They need rigorous play and exercise to prevent inappropriate or destructive behaviors. This people-loving dog loves to be indoors with his family, often a step behind a person at all times. Separation anxiety is common in Weimaraners. They do not make ideal apartment dogs as they have a high energy level and need space to run. Crate training is recommended as they may be destructive when left alone. Outdoor The regal Weimaraner was bred as a hunting dog who can handle the conditions outdoors, but was also meant to live as a companion animal. They enjoy spending time outdoors with their family and need plenty of exercise—but they are not meant to live outdoors. They don't kennel well due to their desire to be near people. Weimaraners are likely to chase small animals and roam, and are known to unlatch kennels and gates on their own—so they should be supervised while outdoors. Exercise High-energy Weimaraners need plenty of physical activity in order to be happy and well-behaved. The more activity, the happier this energetic breed will be. They need one to two hours of high-impact exercise per day to prevent undesirable behaviors. Walking is often not enough for this breed—Weimaraners prefer to burn off energy by running or jogging. Endurance The athletic Weimaraner is a dog with an abundance of energy and high endurance. His stamina means he may want to keep going, even after you're ready to call it a day. While Weims are usually raring to go, it is important to slowly build up to strenuous activity. Bones continue to grow until the dog reaches two years of age, so high-impact activity should wait until adulthood. Running Miles: A well-conditioned adult Weimaraner may be able to manage a 10-mile run with energy to spare. Some Weimaraners have accompanied their owners on marathons. Hiking Miles: Weimaraners in good health may enjoy hiking up to 20 miles. Food Weimaraners are incredibly food motivated. The breed responds well to treats during training sessions. The general recommendation for how much high-quality dry dog food (based on average weight and activity level) to feed is two to three cups of food per day. This amount should be split between two or three meals and should be fed after extensive activity to prevent bloat. Weimaraners are known to 'counter surf,' or search countertops, trash cans, and sinks for food items. It is important to block access and discourage this undesirable behavior for the dog's safety. Alone Time The people-loving Weimaraner does not do well on his own for long periods of time. He requires plenty of stimulation, both mental and physical. Weims often display behaviors related to separation anxiety such as chewing, digging, and barking. They are happiest when they are near their family. Weimaraners left home alone should be crate trained to prevent destructive behaviors. This short, smooth-coated breed sheds year-round, but does not require excessive grooming or care. Brushing weekly and baths as necessary are usually all that is required for the low-maintenance Weimaraner coat, which repels dirt naturally. Weims are known to roll in smelly patches of ground, so bathing may be necessary to remove odors. Trimming nails regularly will help prevent painful splitting, cracking, or breaking. Droopy ears like the Weimaraner's should be cleaned regularly to prevent infection. Skin irritation can present in Weimaraners; the most common causes are food allergies or sensitivity to grooming products. You can minimize serious health concerns in a Weimaraner by purchasing him from a reputable breeder who engages in responsible breeding practices, and through screening for common diseases and conditions. While the Weimaraner is a highly intelligent breed, he may be stubborn. Weims can learn basic obedience with ease if consistent, ongoing training begins in early puppyhood. Weimaraners are not ideal for first-time owners without a dedicated training plan and resources. Advanced training is a perfect way to burn off some of the Weimaraner's excess energy. Their intelligence and impressive problem-solving skills make them a great pick for advanced training such as agility, dock diving, advanced tricks, nosework, tracking, and as therapy dogs. Weims appreciate the time they are able to spend with their humans during advanced training and competition. Originally bred as a gentleman's hunting companion, the Weimaraner is a solid choice as a hunting dog. He has a natural instinct to hunt and his keen nose makes him an admirable scent dog. The Weimaraner's rambunctious nature may make for a difficult first-time hunting dog. They're fantastic pointers and trackers, and retrieve without hesitation. Early, continued training is necessary to channel the Weimaraner's energy and smarts in an advantageous way. An older, experienced dog will help a young Weimaraner learn the ropes in the field. Unlike other hunting breeds, Weimaraners should not be expected to live in a kennel environment, as they are a social breed. What Is Shaky Puppy Syndrome? Hypomyelination, or 'shaky puppy syndrome,' is a central nervous system disorder that may occur in Weimaraners when the fatty protective layer of nerves—called myelin—is too thin. Nerves are important to muscle function, so a myelin deficiency may cause tremors, lack of coordination, or balance issues. Symptoms of shaky puppy syndrome usually present by 2 weeks of age. Puppies showing symptoms would undergo a series of physical exams, x-rays, and procedures to rule out other medical conditions that could cause tremors—hypomyelination can be diagnosed only in a post-mortem examination of the spinal cord. Certain breeds—Weimaraners, Springer Spaniels, Dalmations, Vizslas, and Golden Retrievers, to name a few—are more likely to be affected by shaky puppy syndrome. It is more common for male puppies to present hypomyelination, but females may be affected as well. While most puppies improve by around one year old, tremors may be present through adulthood. Dogs with hypomyelination should not be bred, as it is a hereditary condition. Do Weimaraners' Eyes Stay Blue? Weimaraners are born with impressive blue eyes, but by six months of age their eye color usually changes to the amber, grey, or blue-grey the breed standard requires. 'Nooking' is the name given to a Weimaraner behavior that includes kneading and sucking on blankets, toys, pillows, and other soft items. This suckling occurs in Weimeraner puppies and adults, and may be a comfort-seeking behavior. While nooking is not the same as chewing, Weims are also known to chew. Chewing up and swallowing objects can cause dangerous intestinal blockages and should be discouraged, but nooking is not often a concern—many Weim owners find it endearing.